That a largely self-taught artist could escape his early training in decorative arts in England and a career as a historical painter in Chicago to become one of the most important early California painters is remarkable enough. 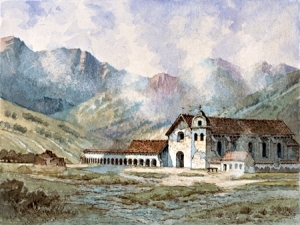 Edwin Deakin was the first artist to paint all 21 missions of California in about 1899. Even more remarkable still is the fact that Sullivan Goss became one of Edwin Deakin’s most important present-day dealers. Until relatively recently, scholarship on Edwin Deakin was quite thin. Former Oakland Museum of California Director Paul Mills did a lot the heavy lifting early in his career. 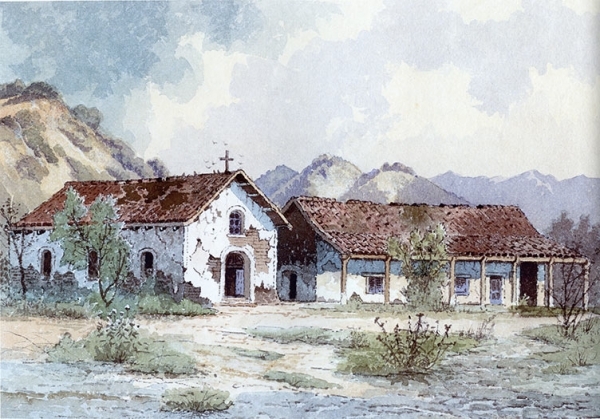 For quite some time, his book A Gallery of California Mission Paintings was the principal book devoted to the subject. More recently, the current Director of the Crocker Art Museum, Scott Shields, and former dealer Alfred C. Harrison, Jr. wrote a handsome monograph on the artist called Edwin Deakin: California Painter of the Picturesque. In between the publication of the first volume in 1966 and the second in 2013, this humble web page served as a valuable source of information about the life and art of Edwin Deakin. Perhaps because of our web page, we were contacted in 2013 about the availability of the first ever painted set of the California Missions. 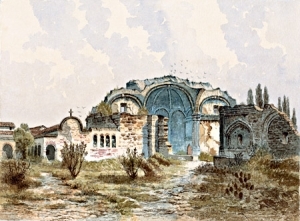 That same year, Sullivan Goss mounted one of its most successful and important exhibitions called Along El Camino Real: Edwin Deakin’s Twenty-One Missions in Watercolor. Through the patronage of Mrs. Winifred Vedder and the previous owners of the suite, Sullivan Goss was able to arrange for the Santa Barbara Historical Museum to acquire the paintings. 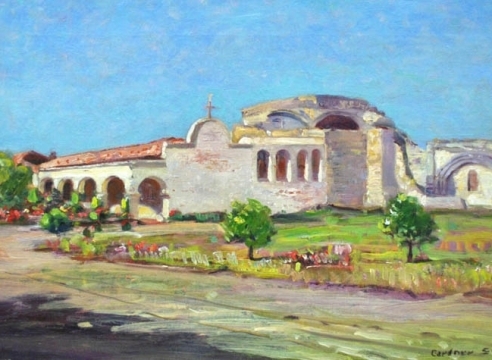 That is how it came to be that Santa Barbara became home to two of the artist's three completed sets of paintings of the California Missions. The other is housed at the Santa Barbara Mission Archive Library. Gallery Principal Frank Goss remains a researcher and lecturer at large on Edwin Deakin and the staff at Sullivan Goss remain committed to the legacy of this important early California artist and continue seek out superior works to exhibit and sell. Living in Santa Barbara, one cannot escape the influence of the missions on the aesthetic of California. Thanks to the energetic Pearl Chase, the woman who crafted much of what has become the city's famously strict architectural code, red tile roofs run continuously from the mountains to the sea, uninterrupted by either tall buildings or modern developments. Thus the Mission Style that stretches now from its origins in stately homes and public buildings as far as the Taco Bell logo carries a special significance in this town, where it manifests in such an extraordinarily thorough and visually appealing way. 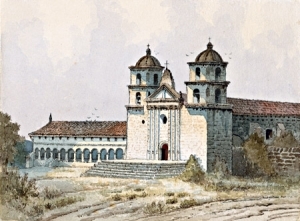 Across the coastal region of California from San Diego to San Francisco is a series of 21 missions established by the Spanish Catholics of the Franciscan Order. Founded between 1769 and 1823, these outposts have endured over time and are among the oldest monuments in the state. The missions have a vast and significant local as well as national history that have been shaped through time and preservation. 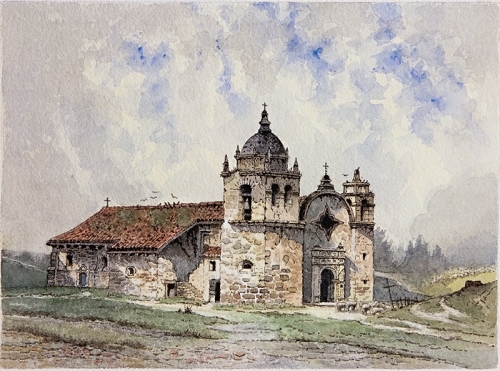 THIS HISTORIC EXHIBITION of 21 watercolor paintings of each of California's historic Spanish missions–created between 1897-1900 by Edwin Deakin–comes to Sullivan Goss on March 7, just in time for the gallery to mark its 29th year in business with a significant display of our state's history. RELICS, RUINS, REMINDERS? THE SERENE BEAUTY OF THE OLD ALTA CALIFORNIA MISSIONS has come to light with the unveiling of a suite of paintings by Edwin Deakin that were in storage for most of the last 110 years. Sullivan Goss: An American Gallery will be hosting this group of 21 watercolors March 7th through June 30th in an exhibition titled, Along El Camino Real: Edwin Deakin's Twenty-One Missions in Watercolor. Lost Mission Watercolors - Found! At the time, the lone rider made his way along the abandoned "King's Highway" from San Diego to Sonoma visiting each of the 21 Mission locations. An order to disband the Missions had been issued in 1813 and by 1838, the Missions were completely desecularized. Many of the properties were used for alternative purposes or were left to ruin. 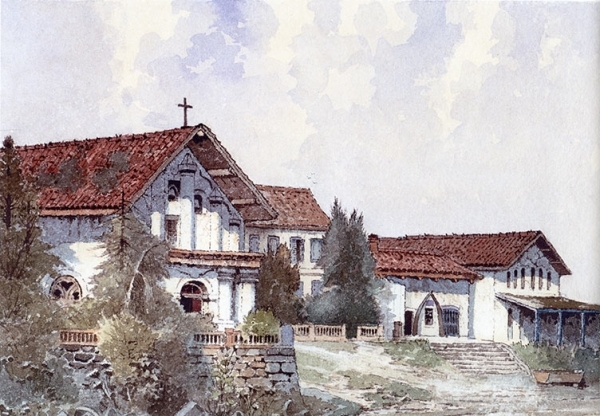 To Edwin Deakin, the "artist historian," is directly due the inspiration of the many clubs and the History Sections of the several women's clubs that are to-day enthusiastically taking up the subject of the opening and the restoring of El Camino Real, the King's Highway, in California. About two years ago (circa 1902) Mr. Deakin exhibited at the Palace Hotel in San Francisco his marvelous collection of paintings of the twenty-one Mission of California, with an accompanying map showing the positions of the Missions. The twenty-one Franciscan Missions are strung along El Camino for distance of nearly one thousand miles north and south, and traversing about three hundred miles east and west. The road as shown on the map is the original road made by the Fransican Padres in the establishment of the Missions, which are about one "Spanish day's" journey apart, and it still exhists in good country roads for part of the way, though nearly obliterated in some sections. If these roads can be united into a State road for the entire distance, the original King's Highway of California will be restored, making it one of he longest and finest coaching roads in the world. In the selection of sites for the Missions the Padres showed great discernment and exquisite taste. The Missions, for the most part, lie conveniently near the sea, in sheltered valleys, with the great Coast ranges behind them, or close to some mountain stream, whose waters keep ever grean the rich pasture lands of which their vast herds of cattle grazed. The magnificence and variety of the scentry along the Highway is unsurpassed. Orange and olive groves, vast vineyards and waving fields of grain, miles of pasturage resplendent in spring awith the golden eschscholtzia, forests of redwood and the pungent eucalyptus, esntensive orchards of apricots, prunes, peaches, and other semi-tropical fruits, are some of the sights that will great the eye of the sightseer with the restoration of El Camino. This photo of the senior Deakin was done by R. H. Furman and appeard in the Outlook article. Here Deakin is not unlike the visage of Samuel L. Clemens. The woolley mustache, combed-back grey mane and dark overcoat are classic symbols of the old West. It is proposed by the several clubs that have at heart the improvement of these romantic and picturesque landmarks of California, not only to reconstruct this Highway, but to restore the twenty-one Missions, and establish at each place a museum of art and curios characteristic of the Indian settlers. The Franciscans were not only skilled in the crafts, they were versed in the elements of the arts, and that they taught the useful mechanical arts and the tilling of the soil, as well as the merely ornamental and beautiful, is evidenced by the weaving, the simple pottery, the intricate basket-making, the work in silver, copper, iron leather, and wood graving, as they exist to-day, as survivals. When these treasures are collected and classified, the Missions will be found to have had distinct and individual characteristics, as is shown by the paintings in pigments of flowers and clay at San Fernand, the work in silver and leather at Santa Inez, in iron and copper at San Luis Rey de Francia. There will be exhibits of historical weaving and carving at San Gabriel, San Juan Capistrano and Santa Barbara. This reproduction of Deakin's mission painting first appeared as a full page illustration in the 1904 Outlook article. Below the photo in very small print appeared the following: "Copyright, 1899, by Edwin Deakin." Illuminated missals and bookbindings in old vellum still exist to attest to the artistic skill of the Indians so faithfull, so patiently taught by these simple living, pious Padres. The Padres taught the Indians the art of peace and civilization, and by every means in their power strove to lift them out of the depths of savage life and thought. How far they succeeded is pitifully told in the few relics that remain to us of the natives' handiwork, and in the ruins of the Missions that are, historically and architecturally, the noblest in the United States. Seventeen of the Missions as built can be seen to-day only on canvas, and only on one painter's canvas. The four remaining missions were painted from daguerreotype, an old painting, a photograph, and description. The artist made most careful studies of the sites; Nature supplied the background and atmosphere. The story of Edwin Deakin's struggles and sacrifices to perpetuate these missions before the destorying hand of time and the vandalism of generations of robbery and abuse had utterly obliterated them is as noble a one and as pathetic as any of the many such stories in the realms of art and letters. Unlike geniuses of other times, Mr. Deakin has not had to die to have his work recogized. Hist twenty-one Missions as painted might stand as a monument of any artist's life work, but they by no means represent Mr. Deakin's entire work. Coming a very young man to San Francisco in 1870, he at once began the study of the Missions, and from that time studied and painted at intervals untill 1899, except for a period of about two years when he lived in Paris and London, where he was well known in art circles, and where his work received recognition at the Paris Salon. His two pictures submitted, Mont Blanc and L'Eglise de Chelles, La Soir were hung in the Salon of '79. The paintings since made from his studies and sketches of the Chateau Cluny, Notre-Dame, the old chruch at Stoke Pogis, and other historic places, have been prized by art-lovers, and hang to-day in the gallereies of connoisseurs. Love of the old, the picturesque, and the romantic came to Mr. Deakin in his earliest youth, when as a boy in England he wandered among ruins of churches and castles, dreaming of valorous deeds of bygone heroes, and in fancy, weaving stories and pictures to fit the hallowed scenes. It is not to be wondered at that after leaving Chicago, where his professinal career began in 1869, the crumbling walls of the Missions, the tender sentiment that clung about them, with their Old-World air of peace and restfullness, should awaken anew his youthful devotion to the historic past. 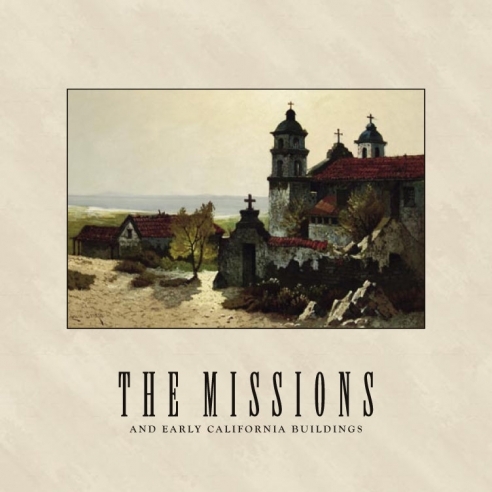 Mr. Deakin went far into the sudy of the history of the Missions, made numberless sketches of wall and tower, took innumerable journeys to out-of-the-way Missions, and has imparted to us, through his interpretation, the story and sentiment of early California life. Mr. Deakin's work is far from being finished. He hopes and expects to paint the Jesuit Missions of Southern California, and probably also even those of Arizona and Mexico. George Augustus Sala said of Mr. Deakin's work, "A man who can paint stone like that is a fool to stay in California." (Ed. Note: This reference to Sala seems so out of place, except that Sala, 1825-1896, was a famous journalist and caraciturist in London who must have thought California to be the most backwater haunt for an artist of Deakin's caliber.) It is in California, however, that Mr. Deakin's heart is, and there he has put his very best efforts. He has done with the Missiions what no other man has done, what no one else can hope to do, for he began thirty-two years ago (Ed. note: 1872), before the Missions, though sadly, marred by time, had fallen into the hands of the renovator! Ed. Note: Today known as the Carmel Mission. It was off in a field by itself at the time of the painting. Today the building sits amidst the village of Carmel. The paintings of the Missions has covered a period of thirty years as inspiration prompted, the artist begrudging neither time, study, trouble, nor expense to obtain the best results. It is gratifying to note htat the work of recent years, that undertaken by the Landmarks Club of Southern California particularly, is being done along scientific lines by experts, who adhere as far as possible to the original plans and materials used. But the great work of to-day, and one that will facilitate the restoration of the Mission, is the opening up of El Camino. This will lead the sightseer, the visitor, and all lovers of the romantic to the now almost inaccessible Missions, those far from the railways and beaten paths of travel. Then, perhaps, will be revived the old-time custom of the Franciscans of providing horses for travelers at one Mission, to be left at the next, and to be returned in due time by the first returning traveler. Guests were welcome to all that the Mission could provide, as well as to the useo fthe horses that carried them on their way. But, more than likely, the automobile, at so much an hour, and the modern hotel, will replace the Padres' genial hospitality.